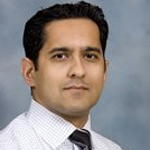 Dr. Chirag Shah joined the Heart & Vascular Center of New Brunswick in 2009. He was an attending staff cardiologist at the University Medical Center at Princeton since 2007 prior to joining the practice. He is board-certified in Internal Medicine, Cardiovascular Medicine, and Nuclear Cardiology. Dr. Shah practices non-invasive cardiology and diagnostic cardiac catheterizations with interests in echocardiography and nuclear cardiology. Dr. Shah graduated with Highest Honors from Rutgers College where he received his B.A. in Biology. He then went to medical school at UMDNJ School of Osteopathic Medicine. He completed his Internal Medicine and Cardiovascular training at UMDNJ Robert Wood Johnson University Hospital and served as Chief Fellow in 2006 during his cardiovascular training.